Original poster. A truly pretty good motion picture and an awful poster. When Jane Greer was cast as the femme fatale in “Out of the Past,” director Jacques Tourneur explained what he wanted from her: “First half of film, good girl; second half of film, bad girl. 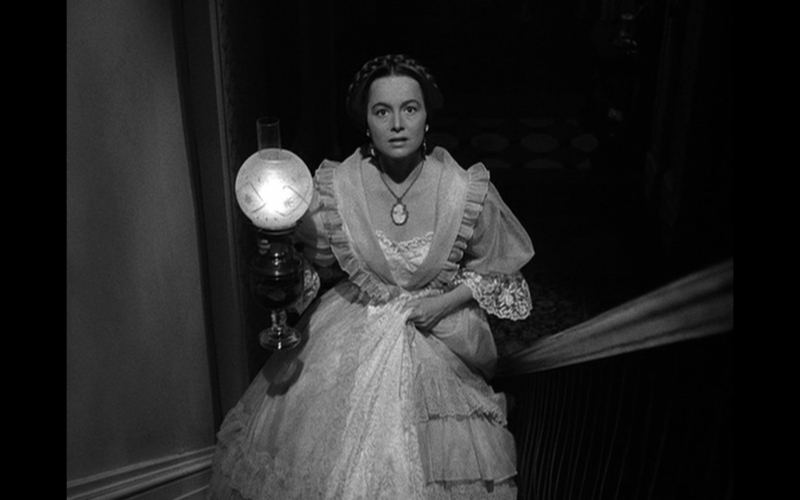 No big eyes!” In “The Heiress” (Paramount, 1949), Olivia de Havilland pulls essentially the same trick, though she uses big eyes from first to last. For two thirds of the picture, she plays Catherine Sloper as a ninny, almost a mental defective; she pitches her voice up high and speaks her dialogue like a child reciting “The boy stood on the burning deck.” Then she gets her heart broken good and hard, whereupon her voice drops an octave and she is instantaneously transformed into a shrewd, cynical, hard-bitten spinster with steel in her spine and ice water in her veins. She won the Academy Award for her performance. Taken as a whole, what she does is little more than a parlor trick, but there are individual scenes that she plays beautifully. Catherine is an unattractive, painfully shy young woman who lives at 16 Washington Square with her imposing father, Dr Austin Sloper (Ralph Richardson) and his recently widowed sister Lavinia (Miriam Hopkins). Catherine’s late mother was a great beauty; Dr Sloper cannot conceal his shame and irritation that their child has grown up to be so untalented, awkward and brainless. 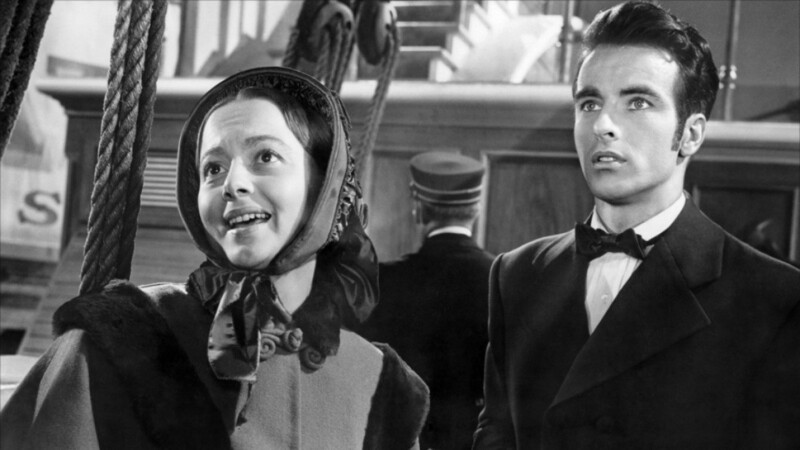 When Catherine falls in love with a handsome young man named Morris Townsend (Montgomery Clift), Dr Sloper very quickly concludes that her suitor is a fortune hunter. Lavinia, a sentimentalist and busybody, believes otherwise. Catherine has an annual inheritance of $10,000 from her late mother, and stands to inherit an additional $20,000 annuity upon her father’s death. Dr Sloper threatens to leave his entire estate to his clinic if she marries young Townsend. But when the girl proves obdurate, Dr Sloper loses all patience; the savagery of his scorn is overwhelming. Richardson played the role in the West End; Basil Rathbone played it on Broadway. Rathbone must have been excellent, but I doubt anyone could have played, or will ever play, this scene better than Sir Ralph. You can hear how her voice descends on “Oh, what a terrible thing to say to me . . . ” There’s more heartbreak on the way for Catherine, but from that line till the end of the picture, her voice stays down at the bottom of her range. de Havilland as Catherine Sloper: The harassed heiress. Ruth and Augustus Goetz, who wrote the play and the screen adaptation of Henry James’ novella, “Washington Square,” greatly altered the story by giving Catherine the sort of second act that she doesn’t get in the book. The same terrible things happen to her, but she responds differently. For instance, near the end of the Goetzes’ adaptation, her Aunt Lavinia asks, “Can you be so cruel?” and Catherine replies, “Yes, I can be very cruel. I have been taught by masters.” It’s a great line, perhaps the best in the play and movie . . . but it’s not in the book; more importantly, Henry James’ Catherine couldn’t have said such a thing: she doesn’t have that sort of sophistication. Miriam Hopkins is surprisingly wonderful as Aunt Lavinia; it may well be the only good performance she ever gave. Richardson is superb as Dr Sloper; he is reason enough to see the picture. Betty Linley reprises her Broadway role (Mrs Montgomery, Townsend’s sister). Her scene with Richardson is exquisitely acted. 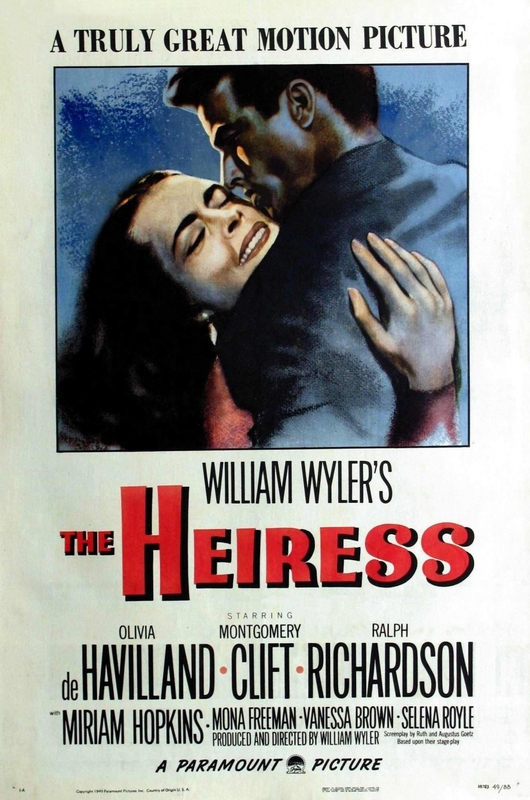 “The Heiress” is the only picture she ever made. Montgomery Clift, alas, is less good. He was never more handsome (even though some of his costumes make him look like Jiminy Cricket), but his posture and casual speech make him seem to exist in a different century from the rest of the cast. 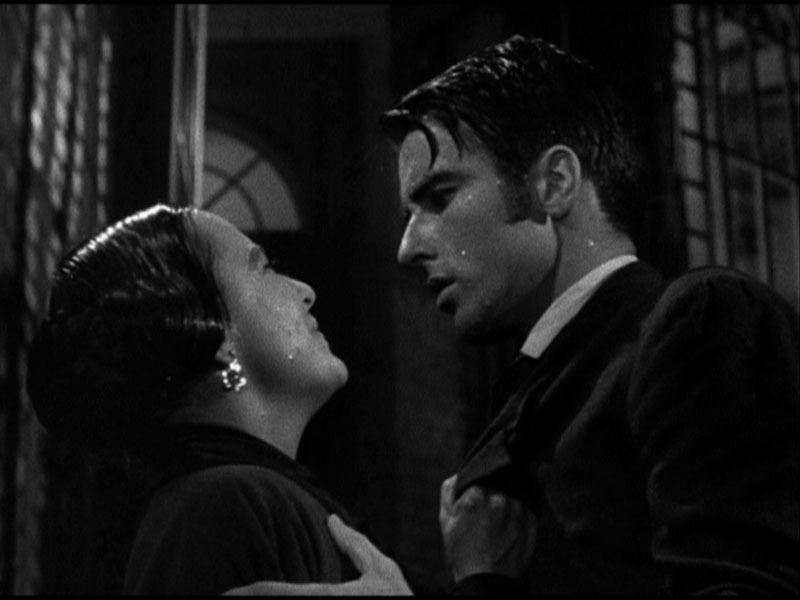 de Havilland, Clift: Promises in the rain. It’s a great shame that William Wyler hated Aaron Copland’s sparse score. He had much of it reorchestrated and reconceived by Hugo Friedhofer, who did the Oscar-winning “important” score for Wyler’s “The Best Years of Our Lives.” Those bars of Copland’s score that remain unaltered offer sad testimony of how great the score must have been before Wyler insisted on a grander, more traditional Hollywood sound. This entry was posted in Main and tagged Aaron Copland, Catherine Sloper, Dr Sloper, Henry James, Hugo Friedhofer, Miriam Hopkins, Montgomery Clift, Olivia de Havilland, Ralph Richardson, Ruth and Augustus Goetz, The Heiress, William Wyler on April 29, 2013 by TR.